WOW...our new topic has got off to a brilliant start when we had our very own Roman visitor. 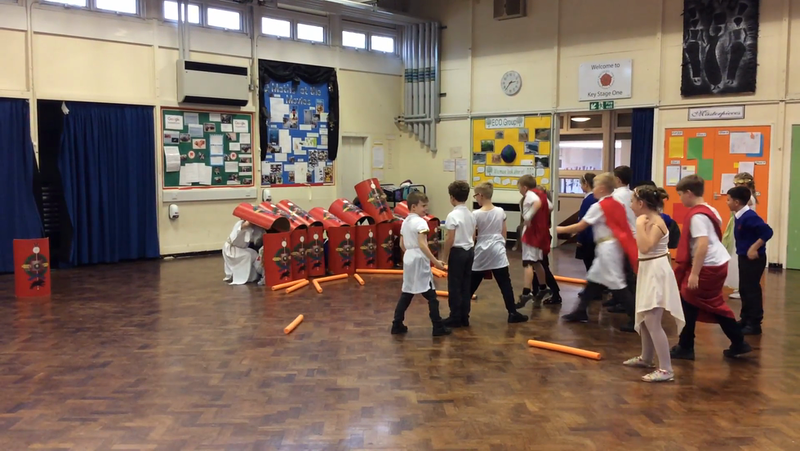 We didn't have a minute to spare during the whole day as we learnt about timelines, life in Rome, the military and we even had our own battle at the end of the day. The children were amazing and showed amazing characteristics for learning. A big thank you to all the children for throwing themselves in to their learning!!!! In reading into writing we have got our ideas flowing to plan 'DUM SPIRO THE RETURN'. Have a look on the links on our class page as you can watch the video yourself. The children have come up with some incredible ideas and we can wait to see their stories. We have been completing perimeter tasks for Ceasar when he had us all designing a Roman Fort using specific dimensions. We have to draw the different rooms and then measure the perimeter. We showed that we can work in teams to help each other with our learning. On Wednesday, we had a Road Safety afternoon where we focused on staying safe when crossing the road. Why not take some time to look at the booklets the children have been given to recap the rules of crossing the roads safely.The children designed some brilliant posters for Year 1 and 2 to help them remember what to do. Our star of the week this week was Milly-Ann who has worked so hard this week to help others and she came up with some amazing ideas for or new class story. - Year 4 parents consultation meetings will take place on Monday and Wednesday. This means the class drop in will start up again on 21.11.17. - Our anti-bullying week starts on Monday and we will be focusing on 'when banter turns to bullying' and we will be having sessions on this throughout the week.